638cc water cooled 8 valve parallel twin with double overhead cams and electronic fuel injection . Suzuki computerised Continuously Variable Transmission with manual and sports modes. Belt final drive. Steel frame chassis with rigid mounted engine as a load bearing member.Conventional front forks and monoshock rear. Dual front discs with 4 piston radial calipers and radial master cylinder. Single rear disc brake.ABS active on both brakes. Scooters are supposed to be cool, stylish and fun. They're supposed to be bought by impressionable young style wannabees, or by spotty young herberts who want a quick thrill on wheels as well as in other ways. Or by commuters looking for the convenience of two wheels without having the perceived hassle of riding a proper bike. Or, of course, by an increasing number of delivery riders - whether fast food or commercial packages - none of whom, it seems, are interested in passing their test. Some of them are also doing The Knowledge, and presumably their devil-may-care attitude toward other road users is part of the training for being a black cab driver in London. All of which makes the 650 Burgman a bit of an anachronism. First of all, it's a 650. Obviously. And that means it requires a full licence to ride. And though Suzuki don't quote power figures I'm pretty sure that the parallel tein engine produces rather more than the 33bhp needed for a restricted licence. It's, um, not exaclty very pretty either though to be fair this isn't the most flattering angle and the bike does look rather better in the flesh. 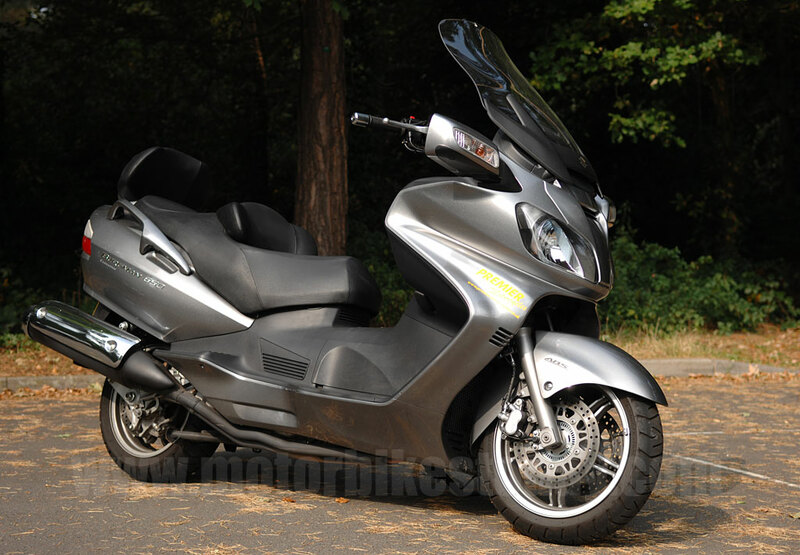 But the bottom line is that, at first glance anyway, the Burgman looks like a bike without an obvious customer base. Which is funny. Because it sells really well. So let's discard the obvious and start from the beginning. Suzuki launched the AN400 Burgman back in the mists of time as one of the first superscooters. 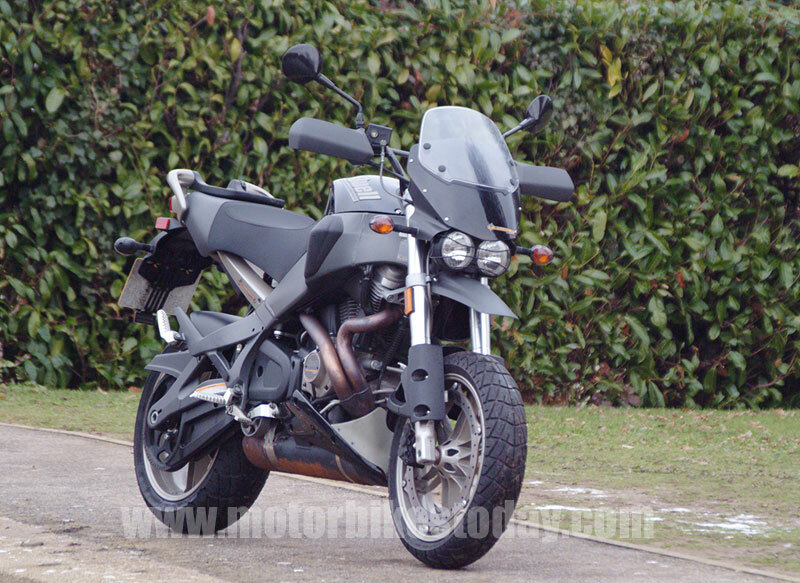 It was quite large and the 400cc engine gave it a reasonable performance. The idea, essentially, was to combine the undoubted benefits of twist and go scooters with full sized motorcycles, producing a scooter that was as easy to ride as usual but had a far better performance. And, in context, the result was successful. The 400 was shortly joined by a 250cc version which offered a slightly less robust performance in a cheaper to run and insure package. But now the other manufacturers were getting in on the act as well, and the Burgman was soon outgunned by some of the opposition. The solution was the 650, with the massively equipped Executive version we have on test here following a little later. So what do we actually have? Well, the Burgman is a physically fairly large bike and it's heavy, too. There is a lot of bodywork, from the effective fairing through to the voluminous underseat storage, and there are lots and lots of toys. We'll come onto those later. The fuel tank is under the seat, accessed by a car style flap on the left. Wheels are a compromise size of fifteen inches, with sensibly proportioned tyres, while the brakes are discs all round with ABS as standard on this version. The suspension is conventional, though devoid of any adjustment. 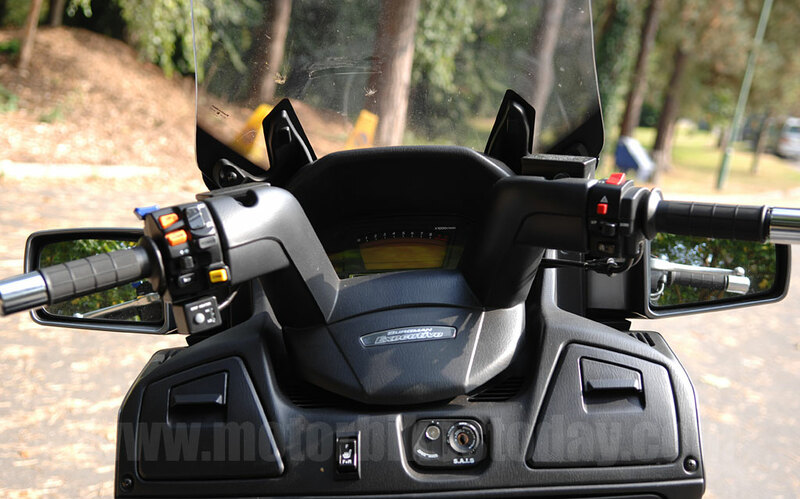 The twin headlights are large and provide agood spread of light, the screen is (electrically) adjustable and has sufficient range to accomodate most heights of rider and the seat is large and comfortable. It is stepped, and the pillion also get a neat adjustable and removable back rest. The rider, too, gets an adjustable cushion to again accomodate differing heights. A bit like being able to pull the seat pad forward on a sportsbike if you prefer to sit nearer the front. On the executive model, by the way, the seats are heated, as are the grips. I ddn't have much call to try them during the test, but they certainly seemed pretty effective when I turned them on out of curiosity. The mirrors are likewise large and well placed, and don't blur too much. 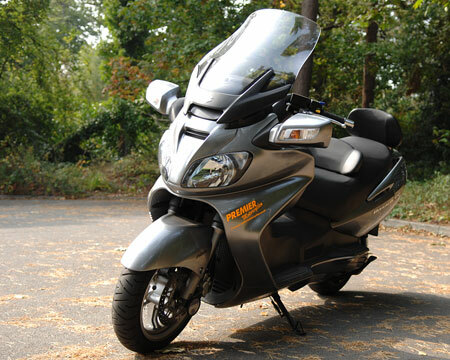 The rear view is pretty reasonable, in fact, and the mirrors offer one of the best party tricks of any bike in 2009. They fold. Electrically. The extra six inches room that folding the mirrors in gives you is the difference between a reasonable commuter and a rush-hour weapon. With the picture on the left this is probably a good time to explain just how many toys there are here. So on the left bar we have, top to bottom, the blue mirror fold/unfold button, orange manual shift buttons (top changes up, lower one down), headlamp dip/main beam (inboard of gearshift) and horn, with the grey power mode selector and yellow manual/auto selector inboard of the horn. The three position heated grips control is below the main cluster. Heated seats are controlled by the switch next to the ignition. The screen adjuster is the black switch below the red hazard light controller on the right bar. Riding is an interesting experience. Now I admit that this isn't something I would normally have gone for. A brief trawl through the site will show you that we're pretty light on scooter reviews. But some light fingered toerag lifted my GSX-R and so Premier Suzuki were kind enough to loan me the Burgman while I was waiting for my replacement bike to turn up. As a result, I had it for longer than usual and used it quite thoroughly. But it took a while for us to bond. Starting the engine is as straightforward as you might expect. With no clutch, pulling away is easy and all the controls fall comfortably to hand. Hmm. Very comfortably, actually. The riding position is surprisingly adaptable. You can decide to ride cruiser style with your feet out in front or you can use the two moulded ridges in the footboards further back, pretend they're regular pegs and ride normally. Both work equally well. Cracking the throttle open gave a respectable, though hardly sporting, turn of speed and the automatic gearchange is smooth. Seems to happen at around the right time, too. The first roundabout will be a test, though. Because scooters are notorious for not handling. Hmmm. This one does, though. Later on, when we're properly acquainted, there is some serious scraping going on through one particular favourite roundabout on my way to the office. It isn't big, it isn't clever but my word it made me chuckle. Performance all round is something of an eye opener, to be honest. Because I, probably like you, thought that scooters were, by default, slow and frankly a little boring. The last thing I expected was to find the Burgman was actually a pretty respectable performing motorbike wearing odd clothes. Acceleration, as I've hinted earlier, is brisk to the point of being able to leave most cars, even vaguely quick ones, at the lights and will certainly be enough to trouble a complacent 600 sportsbike rider as well. Top end, where permitted, is well over a hundred miles an hour, and the whole plot feels perfectly stable at legal, or even reasonable, cruising speeds. The brakes, considering that they have a lot of weight to stop and aren't actually very big, are perfectly adequate with the ABS offering just the right amount of backup for the more ham-fisted rider. The electric screen makes an enormous difference on the open road. Putting it into the lower position, while giving the rider a bit of a breeze, comfortably adds ten miles per hour to the speed held on a constant throttle - it's like putting out an airbrake when you raise it and you can feel the whole bike being slowed by the enormous sail. And while we're nit-picking, although the folding mirrors make filtering through traffic a lot easier, they then give you the interesting quirk of having a bike wider behind you than in front. Which can be a problem when you're filtering enthusiastically. Because you run a risk of hitting things you thought you'd cleared. Which can lead to some awkward conversations. Especially because the Burgman is rather long and has a turning circle similar to an oil tanker. A small one, to be sure, but if you're looking for supermotard-like agility you're in the wrong place. Back to the positives, then. 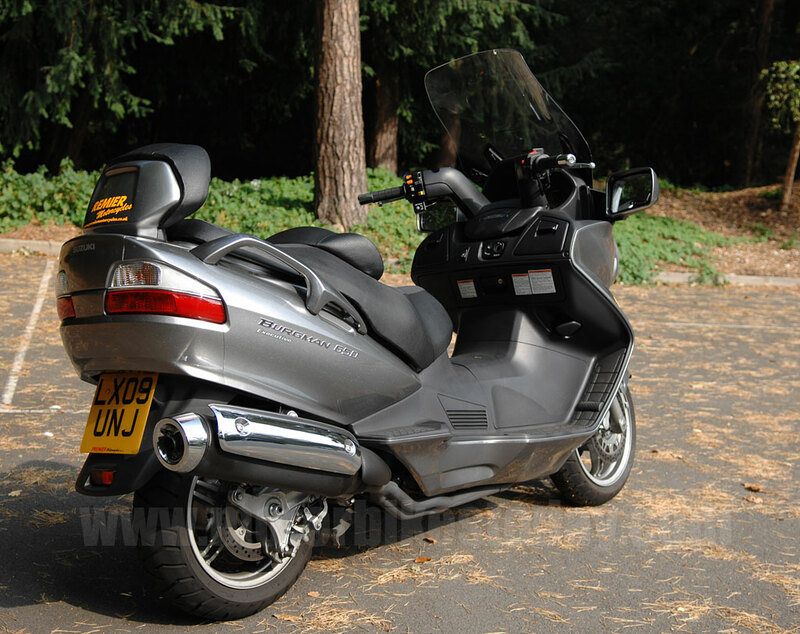 Pillion accomodation is comfortable and secure, and having someone of normal human size on the back makes absolutely no difference whatsoever to performance or handling. There's a cavernous stowage area under the seat that easily swallowed my laptop and work clothes, and has the added bonus of being waterproof. Which is handy. There are stowage areas in the fairling, too, though I never had call to use them. So the long and the short of it is this. The 650 Burgman is a capable commuter, adequate tourer and pretty well perfect everyday utility bike. It goes, handles and stops far better than it has any right to and it manages to provoke a grin under most circumstances. It's not my bag, to be honest, but if I were in the market for a bike of this genre then I'd not be looking any further than this. As usual, thanks to Premier Suzuki in West Wickham, Kent - 020 8777 8040 - for the loan of their demonstrator for a few days under trying circumstances. Nice people, private company, worth doing business with. And Suzuki's Regional Dealer of the Year as well.